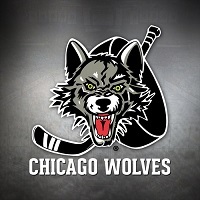 Unfortunately, we’e going to have to cancel the September CVO meeting due to a number of complicating factors. 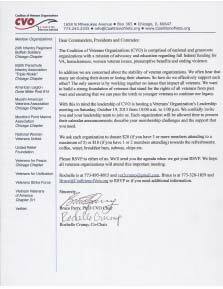 The next CVO meeting will be on Wednesday, October 18th at 7 PM in the conference room on the 2nd floor of the Jesse Brown VA Medical Center in Chicago. We’ll send out our usual reminders, so stay tuned! In the meantime, autumn is starting; Enjoy! 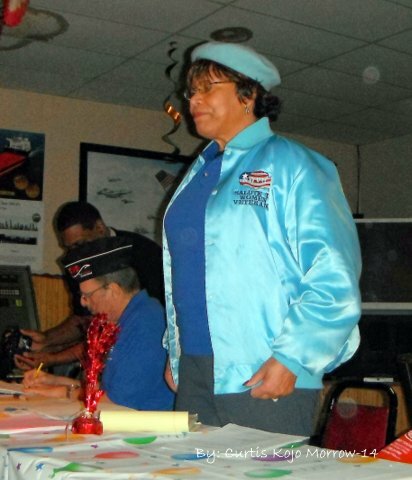 The next meeting of the Coalition of Veterans Organizations (CVO) will be from 10 AM to 12:30 PM on Saturday, July 19th at the Manual Perez Post 1017 American Legion, 2658 S Hamlin Ave, Chicago, IL 60623 (773-522-9315). We’ll discuss the carrying our message to the Legislators, what’s going on in the VA, the VA Crisis Hot Line, and more. As usual, donuts and coffee will be served! Get there early so we can get started on time! CVO will be holding its regular March meeting on Saturday, March 15th at the Austin Community Resource Center (the Old Austin YMCA) at 501 N. Central Avenue in Chicago. You asked that we move the meetings around, so we’re holding this one on the West side. Future meetings will be in other areas. The meeting will be from 10 AM to 12:15 PM. Please be on time since we only have the venue for the designated times! Of course, Coffee and Donuts will be served! Bring your Individual Dues ($10) or Organizational Dues ($50) to be a member in good standing! Save the Date! We’re having our Annual CVO Fundraiser on Saturday, May 17th from Noon to 4 PM at the Japan Hibachi Grill at 76th and Cicero. It’s Armed Forces Day! We’ll have live entertainment, an awards ceremony, door prizes and raffles all afternoon! The food there is great! Don’t miss it! Put it in your calendars now and come out and support CVO and veterans. We only have one fundraiser a year and this is it! Tickets are only $25 per person. We need your support to make CVO the very best we can be! Come and support us at both events! Re-elected Directors: Taalibdin Shabazz, Director, Bruce Parry, Chair, Darryl Howard, Legislative Director and Connie Edwards, Recording Secretary. Left is Natalie Cramer of the Blue Star Family Platoon. 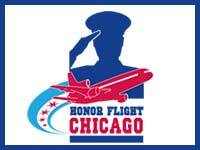 CVO Endorsed their drive for a Blue Star License Plate for families with members serving in the military. The right is Natalie Cramer with Bruce Parry, CVO Chair. 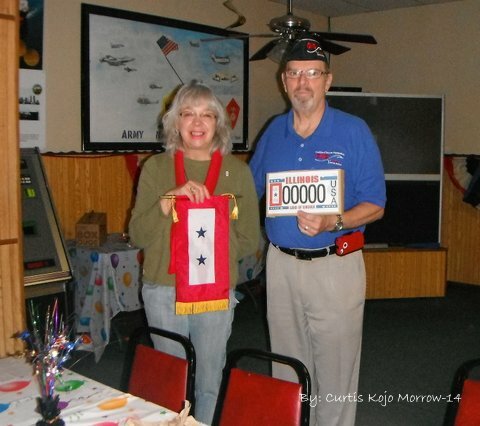 Natalie Cramer of the Blue Star Family Platoon with Bruce Parry, CVO Chair, displaying a mock-up of the Illinois license plate they hope to sponsor for Blue Star Families. 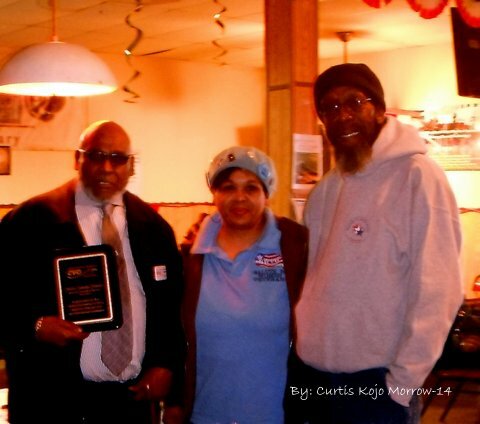 Charles "Smudge Coleman holding the plaque CVO presented him with CVO Co-Founders Rochelle Crump and David Rogers. The re-elected CVO Executive Committee members with the Chair: Taalibdin Shabazz, Director; Bruce Parry, Chair; Darryl Howard, Legislative Director; Connie Edwards, Recording Secretary. Connie Edwards, CVO Recording Secretary addresses the January 18th CVO meeting at Montford Point. 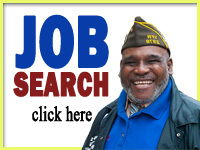 Please forward this invitation to all Veterans Organizations you are in touch with. 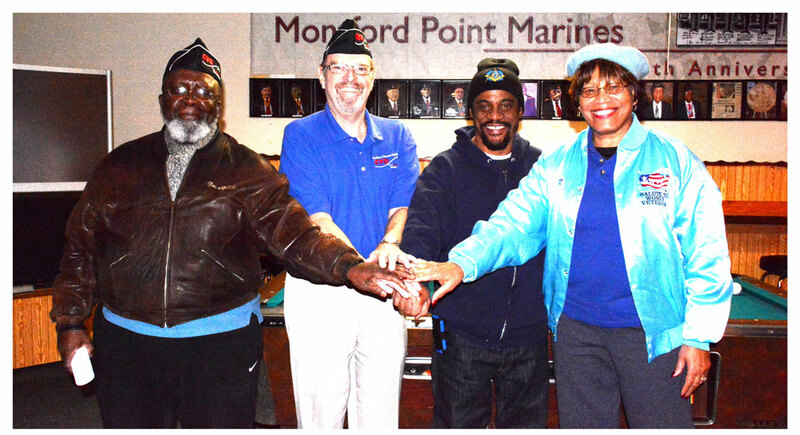 The Coalition of Veterans Organizations (CVO) is hosting a Veterans’ Organization’s Leadership meeting on Saturday, October 19, 2013 from 10:00 a.m. to 1:00 p.m at the Montford Point Marine Association, 7011 S. Vincennes in Chicago. We cordially invite you and your leadership team to join us. Each organization will be allowed time to present their calendar announcements; describe your membership challenges and the support that you need. CVO is comprised of national and grassroots organizations with a mission of advocacy and education regarding full federal funding for VA, homelessness, women veteran issues, presumptive benefits and ending violence. In addition we are concerned about the stability of veteran organizations. We often hear that many are closing their doors or losing their charters. So how do we effectively support each other? The only answer is by working together on issues that impact all veterans. We want to build a strong foundation of veterans that stand for the rights of all veterans from past wars and ensuring that we can pass the torch to younger veterans to continue our legacy. We ask each organization to donate $20 (if you have 3 or more members attending to a maximum of 5) or $10 (if you have 1 or 2 members attending) towards the refreshments; coffee, water, breakfast bars, subway, chips etc. Please RSVP to either of us. We’ll send you the agenda when we get your RSVP. We hope all veterans organizations will attend this important meeting. Rochelle is at 773-895-8015 and vet2crump@gmail.com. Bruce is at 773-320-1859 and Bruce@CoalitionofVets.org to RSVP or if you need additional information. We’ve heard what you’ve said! We’re moving our meetings around so they are more accessible to a wider group. The next meeting of the coalition of Veterans Organizations (CVO) will be this Saturday, September 21st from 10 AM to 12:30 PM at the Jesse Brown VA Medical Center. It will be in the Vision Room on the 2nd floor in the Damen Building next to the Director’s Office. Parking in the garage will be validated. Come early so we can start on time! 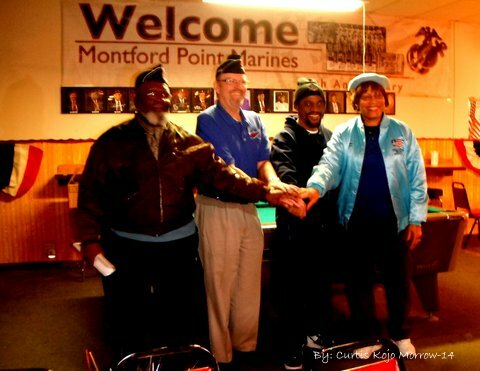 Due to a number of conflicts, the next CVO meeting will be held on Saturday, August 31st from 10 AM to 12:30 PM at the Montford Point Marine Association at 7011 S Vincennes in Chicago. This is instead of meeting on the third Saturday of August as we normally do. We will send out regular reminder emails and make reminder telephone calls during the week prior to the meeting.